← Happy Earth Day! Let’s Talk about Bird Nests! In a gap between finals and rain showers Deborah and I went down to the Roaring Run Trail for a late morning bike ride and walk. There were very few people on the trail and, so, lots of “real” things to see. I had to keep my eyes on the trail ahead of me as I pedaled along because there were dozens and dozens of large North American millipedes (Narceus americanus) crossing the trail. 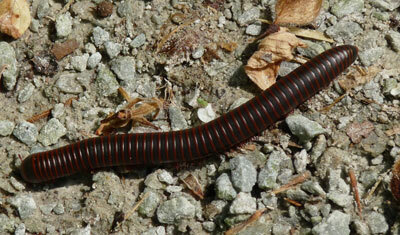 These millipedes thrive in cool, moist forests that are full of leaf and woody debris. They are important components of the decomposer web by which carbon in plant materials are cycled into soil organic matter and nutrients are recycled for new plant growth. They are large but quite harmless to people. They can, however, secrete a yellow liquid when disturbed that can stain your fingers. These millipedes are eaten by many birds, amphibians and reptiles, and they are a particularly favorite food of shrews. I managed not to run any of them over, but there had been some millipedes beforehand that were not so lucky. Further down the trail a male wood thrush perched on a branch at the edge of the hillside woods and flicked his tail at me as I biked past. His rufous colored head feathers and sharply streaked white breast were breathtakingly beautiful. These males have, like the orioles, just arrived from Mexico and Central America and are contesting with each other for breeding territories as they wait for the arrivals of the females. I continued down the trail toward the town of Edmon when I heard the distinctive “chip-brrrr” call of the male scarlet tanager. I stopped my bike and looked up into the tall, spindly trees along the riverbank. I could see three birds as gray blurs against the bright, back-lit sky. Finally one of them flew to a point where I could see his color: bright red. These three male tanagers were also busily involved in a pre-mating contest. They had just flown in from Peru or Bolivia and were marking off and arguing about the twenty-five acres of woodlands they each require for a successful mating nest. Indigo buntings flew through the tangled branches in the thickets near the Roaring Run creek crossing. A pileated woodpecker called and pounded on trees back near the main parking area. There were great birds everywhere! Some of the early spring wildflowers (including the trillium) are still blooming along the trail. There are also new waves of flowers coming in. Fire pink, in particular, has taken over almost every crumbling slope along the newer parts of the trail. Its bright red petals stand out sharply against the bare, black soil of the slopes. Fire pink was the flower that Deborah and I saw every day of our Baker Trail hike two years ago. As we hiked north we followed its blooming phases all the way to the Allegheny Forest. I am still waiting to see the grosbeaks and the towhees, but spring is steadily moving into summer.